"Finnish type" chalets with kitchen and gas heating for 8 persons. Wooden chalets with the possibility of gas heating are suitable for year-round accommodation. Accommodation for 8 people, two separate rooms (5 + 3), shower, toilet,equipped kitchen (fridge, cooker, microwave, electric kettle, cutlery, glasses, cups, plates, pot, pan) and outdoor seating. One of the chalets also has a separated floor with a room for 4 people, its own sanitary facilities and a refrigerator. Cottages can be used then by a group of 8-12 people. The total capacity of "Finnish" cottages is 36 people (4 x cottage for 8 people, 1 x floor for 4 people). 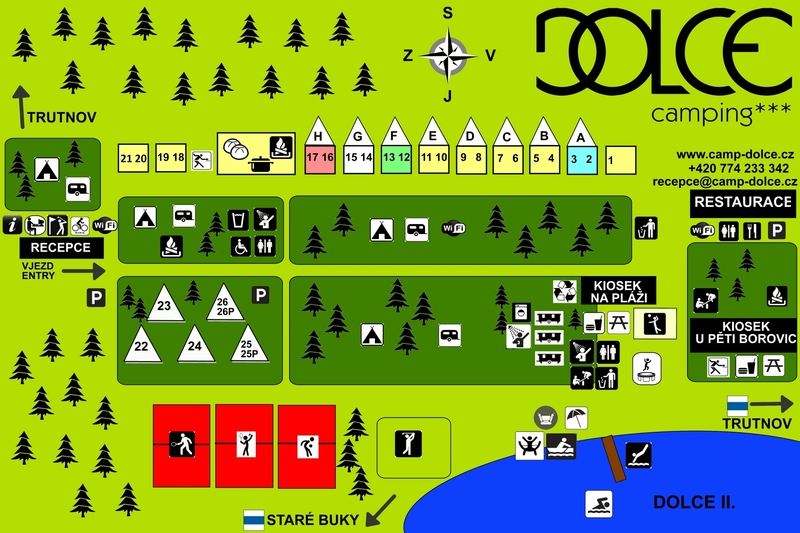 Plan of the recreation area including the locations of the Finnish wooden cottages to be downloaded here. Accommodation price / night 3. 1. - 20. 6., 1. 9. - 20. 12. 21. 6. - 31. 8., 21. 12. - 3. 1.